We will be holding services on Erev Rosh Hashana, First and Second days Rosh Hashana, Kol Nidre and Yom Kippur. We are an egalitarian community with mixed seating and a relaxed dress code. Please ensure all mobile phones are switched off and the rules regarding use of technology and writing etc. are observed while with the community. If you are a member of NSNS there is no additional charge for attending any of the High Holy Day services, these are included in your membership fees. If you have not yet joined or are just visiting you are very welcome to join us for any of the services, we do ask you to let us know when you will be attending in advance, for security purposes (administration@nsnshul.org.uk) and the names and ages of any children. We do not issue tickets. All High Holy Day Services Combined £55 per person. £55 is the annual membership fee for students and those under 30 years old so please consider filling in the forms and joining us. You can also become a member now; it is not too late. Contact us at aministration@nsnshul.org.ukfor a membership pack or to find out more. Our current membership fees are £285 per year (or £166 Sept-April), but no one will be turned away on financial grounds. There will be activities and provisions for children on First day Rosh Hashana and Yom Kippur but children are welcome in all services, provided they are supervised. So we know how many children to expect or if you have any questions please contact please let us know your children’s names and ages at Deborah Syme on: Deborah.syme@gmail.com. Our shul has a tradition of celebrating Sukkot together. Every year we find ways to celebrate this autumn harvest festival together. Sukkot in 2018 will begin on the evening of the 24th October. Following the success of last years event we will again be celebrating Simchat Torah in Stokey Shul. It’s a relaxed, joyous occasion, with lots of dancing and singing, with drinks and snacks for adults and kids. Chanukah 2018 begins in the evening of 2nd December and ends in the evening of 10th December. 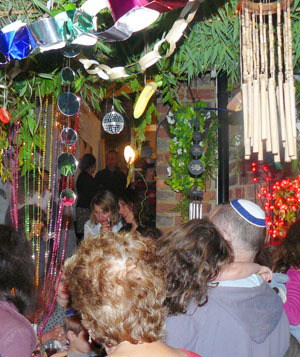 This year our Chanukah party is on Sunday 17th December from 6pm onwards, with candle-lighting at 6:30pm. There will be delicious food and drink, with lots of festival singing. We’re also hosting a Chanukah party for preschool children on the same day, Sunday 17th December from 11am. Contact us for more information. Please join us for our Purim party on Wednesday 21st March 2019! 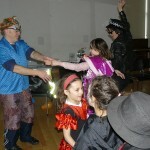 Purim spiel, megillah readings, games and drinks! After Purim we look forward to Pesach, which we mark in our community in two ways – with a Matzah ramble (a walk in the park with a matzah picnic), and an 8th Night Seder on Friday 6th April 2018. For the first time we’ll be hosting services for the festival as well, on Saturday 7th April 2018. Explore Jewish questions at our study evening for the festival of Shavuot. We start with a service, followed by a potluck vegetarian dinner. Shavuot this year will be the night of Saturday 19th May 2018.